"If God can be infinite, then why can't the universe be infinite?" This is a quote from Kelly at the "Nightline" debate. Granted, I have not seen the debate in its entirety because I can't find it anywhere in its entirety. There are always some suspicious and distrustful edits. But from what I've seen, I've loved. I enjoyed it immensely. Anyway, I think I can answer Kelly's question rationally. The theistic concept of a great chasm between Creator and Creation seems to do the trick. There are two very different standards applied each to the theistic idea of "God" and Creation (a.k.a. the universe). To suggest that Creator and Creation each have the equal amount of the quality of infinity is to assume a resemblance between the two that isn't there. So, if the point is to reassert that the universe is infinite, one can do a better job of it than to compare it to theism's God. And if the point is to debunk the claims made by Cameron and Comfort, then one can't do that by redefining their idea of God for them. But the universe isn't infinite. The universe has set boundaries defined by the hyperbolic curvature of the space-time fabric. Granted, the universe is expanding under the push of Dark Energy, but it still has defined boundaries. When you reach the "edge" of the universe, you will simply curve around the side. But like the curvature of the Earth, this hyperbolic shape is so vast that it is completely imperceptible. Hey, that makes sense, man. Hey, that makes sense, man. I read Hawking too. You know, like how it's incoherent to talk about something that happend "before" the Big Bang because that implies time and the Big Bang was the start of time. But it seems appropriate to talk about something that may exist "without" (instead of "before&quot the Big Bang. Granted, you then have to qualify that if something really "is" without the Big Bang, then whatever that "is" has a whole other nature of existence than the kind of things that are subject to space and time. Outside of physics (which I know very little about) I can say this. It would make no sense either way, for creation of the universe considering the fact that (with the exception of earth (so far as we know anyway), a minute spec in the uinverse) the universe is very inhospitable to life (actually it's deadly) so if god had created the universe strictly for our benefit, he wasn't very efficient, and it does not make any sense, infinite or not, to have created a universe that is so inhospitable to life (except for one small planet). It's not rational for the theist to claim god created the universe for our benefit. Hospitality of creation doesn't seem like a very good thing to base the rationality or irrationality of a God-created universe on. I can think of several, more practical examples in creation that arguably are inhospitible to life, but are not really judged as saying something about the benefits of having it or the rationality of having God create it. I think of oceans, which are pretty inhospitable to land-dwelling creatures' lives. At one time, I'm sure people looked out upon this great mass of water and thought it scary and/or deadly. Now, of course, oceans and seas are just taken for granted, and while they can still be deadly, they're more seen as just an awesome part of creation that many people count as a benefit at least just based on the fact they inspire awe. The universe "created" man through natural selection, man created gods through language, therefore gods could not have created the universe. What most say is the Universe is not everything that is or ever was. Our physics Laws tend to fall apart in the "rest" ,which is most, of the universe it seems. Maybe both God and the rest live on long past our spacetime. Maybe they are one in the same. No one can say for certain either way. What we can do is toss the current arguments against a God using theories made for only 4% of the known universe out the door. A "new" Universe is at hand. Some interesting experiments using a Large Hadron Collider will soon be taking place at European Center for Nuclear Research on the Franco-Swiss border. There they hope to create a dark matter particle and ID is as an axion. Axion theories predict that the universe would be filled with a very cold Bose-Einstein condensate of primordial axions. Hence, depending on their mass, axions could plausibly explain the dark matter problem of physical cosmology but will not explain dark energy. Scientist are not holding their breath however as axion detection has not been confirmed. Not only has that not yet been confirmed by other searches, but it might in fact contradict the results of other experiments (e.g. CAST) which have been confirmed. Evidence of Axions will likely point to something before the big bang and the creation of cosmic time and "normal" matter. In short it will screw up a lot of theories on a (pardon the pun) cosmic level more than they were already and force a path that points to something was before the big bang. Natural or unnatural or supernatual will be on a level playing field. Many scientists say that the existence of the axion will be proved or disproved within the next 10 years. As a heavy, stable particle, the lightest neutralino might be the universe's "cold" dark matter. This would lead to other discoveries about dark matter and perhaps dark energy, its properties and how it acts and interacts with "normal" matter and gravity. e303 I respect your points, however they still do not provide evidence for God. Instead, they take a piece of researched science and highlight a bit not fully understand and say "That’s God." This is a God of gaps. e303 say we use theories made from our experience with only 4% of the known universe. What e303 is saying here is that other physical principles may apply outside of this range that we do not understand. This is an example of "The God of Gaps." 100 years ago we may have only examined 2% of the universe therefore making 98% of it "Gods work". However as we advance we will eliminate this "God of Gaps." e303 stresses the point that science is being "forced" down the path of accepting there was something before the Big Bang. Well I don’t feel “forced” is the right word. The scientific community call it the Big Bang Theory....they use the word "theory" because they haven't proved beyond reasonable doubt that the concept is correct. They are not being forced down the path, they are just finding their way down it. Some scientists may have always believed there was something "before" the Big Bang. But in science, unlike religion, you cannot just make claims like that without some supporting evidence or theory that utilises physical principles understood at the time. However, in religion it appears perfectly acceptable to make many claimed without supporting evidence. In addition, I fail to see how proving the existence of the axion brings us closer to accepting God made the world. All it does is open up many new avenues of investigation. Yes, it will screw a number of theories...hence the reason why we call them theories...however axions provide yet more evidence for String Theory. String Theory mathematically accounts for things existing before and around our plane of existence (Universe...not a very good name for it now). As of Neutralino your argument in my opinion is too thin to deal with. I guess what I am trying to say is the rational to deny a God is also irrational. The science that kept many atheist feeling safe about the nature of the universe and ultimately a creator is no longer valid. The physics evoked by most people here to explain a God out of existence cannot hold up in light of new scientific experiments. Does it prove a God. No. Yet no one can say a natural or supernatural entity did not have a hand in creation and that entity did not and does not exist. Here is a good question. What if the dark energy has variable properties? You see accepting one possibility opens a Pandora's Box on others. Dark matter and dark energy make most of the universe and so I say it is rational the evidence about creation is likely founded with them. I think we need to define some words, Atheist & Agnostic. Atheists believe there is no God. To reiterate, Atheists have faith that a god does not exist. Agnostics are open-minded and believe the most probable explanation based upon the evidence provided. I define myself as an agnostic. I am ready to accept the existence of a creator when the evidence to support this view outweighs the evidence against it. In my opinion, atheism is a form of religion as it requires faith. As can be seen on many websites, arguments between atheist and other religious fractions often boils down to “I’m right, Your wrong.” I do not encourage this form of argument as is it unconstructive and damaging to community relations. As an open-minded (aka free thinking) agnostic I believe everyone has the right to their own opinion. Anyone that does not should read the book “1984.” I am quite happy for e303 to have faith the religion of his/her choice. In fact if e303’s faith enhances his/her quality of life, I would actively encourage it. Surely, no matter what your beliefs, you want everyone to be as happy as possible? Having covered how I think people should not discuss their faith, here is how I believe people should discuss their faith. I believe argument should be neutral and factually based. Insults, opinions and incorrect or twisted information dissolves are grounds for an useful discuss. With that in mind here is my reply to e303. e303 said, “I guess what I am trying to say is the rational to deny a God is also irrational.” Yes you are right and I agree with you. Until we have the “Answer” to everything we can never be 100% sure of everything. To say you are 100% sure of thing is faith. If you have faith in something this is an opinion and you should indicate so. e303 said, “The science that kept many atheist feeling safe about the nature of the universe and ultimately a creator is no longer valid.” I feel this is a half truth, yes theories have been disproven but also new ones have been created. In addition it is important to remember that atheism requires faith. Atheists had faith in those theories, in much the same way as some Christians have faith in the stories of The Holy Bible. From a factual point of view, the invalidity of the theories in question neither provides evidence for or against a higher power. e303 said, “The physics evoked by most people here to explain a God out of existence cannot hold up in light of new scientific experiments. Does it prove a God. No. Yet no one can say a natural or supernatural entity did not have a hand in creation and that entity did not and does not exist.” This point I wish to reinforce and want others to bear in mind when discussing faith. e303 said, “Here is a good question. What if the dark energy has variable properties?” This would simply open up new avenues for investigation and provides evidence for neither the existence or the non-existence of a higher power. I do accept the many people with faith will enter into the “God of Gaps” argument. Saying that the “proof” of god is our lack of understanding where variable properties are concerned. I think almost everyone in this thread is missing the point Kelly was trying to make. Saying "god is infinite" is a presuposition not grounded in science. When you make this declaration, you can build anything on it you want. Likewise, you can say "the universe is infinite" with the same result, and you end up winning the argument by Ocam's razor. This isn't a scientific argument at all but rather a philosophical response to an irrational presuposition. Arguing about the truth value of "the universe is infinite" misses the pont entirely. Saying the universe, whatever that means, is infinite and trying to back that statement using a guide for discovery like Occam's Razor does not make sense unless you wish to discount the last 10 years of modern science. "...explanation of any phenomenon should make as few assumptions as possible, eliminating, or "shaving off," those that make no difference in the observable predictions of the explanatory hypothesis or theory. " We cannot observe most of universe because those elements while detectable are out of our reach for experiment and therefor understanding. Occam would be remiss to make any comment or statement in support of or against the question our origin. One can't shave what is unknown and each new discovery adds multiples to the questions at this time. Occam would account for this. I define myself as an agnostic. I am ready to accept the existence of a creator when the evidence to support this view outweighs the evidence against it. In my opinion, atheism is a form of religion as it requires faith. You know actually, the position you've defined is pretty close to weak atheism anyway. Because you have not seen enough evidence that the claim "a God or gods exist" is true, you are logically able to reject that position and resume an atheistic stance without faith. I am simply open to the possibility of a God being of or evolving from nature far removed from our spacetime. A self-aware being that could have said it would be cool to have its lab box with in its own time space and thus created ours. Our "universe" and our normal matter don't seem to be the big players and if Dark Energy is a player of the dust we call our material universe then can't a being of unknown qualities and properties live and/or evolve from there? Basically, I reject the atheist stand that a creator cannot exist and oppose the recruitment of others into that school of thought based on less than 5% of the properties of the known universe. Not believing in a creator is nothing more than a belief system once again. Our "universe" and our normal matter don't seem to be the big players and if Dark Energy is a player of the dust we call our material universe then can't a being of unknown qualities and properties live and/or evolving from there? This chain of thought should also convince you of the possibility of unicorns, black swans, leprechauns, spaghetti monsters, Odin, Thor, Jedi and Beowulf. Why not then believe in everything if you don't have total knowledge to disprove anything? Why not structure your entire life around an assortment of this stuff? One does not require faith or a "belief system" to simply deny claims made without a rational basis. Why is, "There is no God." Why is, "There is no God." rational? There is NO way or scientific reason to believe this. This chain of thought should also leave you, at the very least, an agnostic who is reserved about the possibilities of creation. Why believe in anything if you don't have total knowledge to prove anything? Why not re-structure your entire life around other possibilities? The atheist argument makes a very strong conviction with at best the same amount "evidence" as a theist. All the scientific tests were tests of only a fraction of what needs to be tested to make such a claim until then you have a different type of religion with a mysterious anti-god concept. This isn't a terribly difficult concept to understand. Maybe we'll try a different concept..
You would likely then ask what proof do I have to make such a claim, that your wife is sleeping with other men. Things that might convince you of my claim might be video evidence, forensic evidence (dna trails in fluids left somewhere), photo evidence, and so on. If I had none of these things, you would be able to safely determine that my claim is improbable and then most likely to be untrue. It would here be rational to dismiss the original claim. What would not be sufficient to back this I'd assume would be if I said "My claim was made, you cannot prove it to be untrue because you don't have full knowledge of where your wife is at every nanosecond, therefore my claim must be true." I can't guarantee this makes this any clearer to you, but this is exactly the reasoning we see over and over again from theists. "I'm making a claim, you do not have full knowledge of everything in the universe, therefore I'm correct." I was just noting that if this logic is good enough for you, it should be equally good to prove the existence of unicorns, dragons, that teapot orbiting mars, Odin, fairies and so on. With respect; your argument and examples are flawed. I can test an apple and show it is not an orange because we have a set of things that are known and testable. In the most recent past much of scientific evidence that atheist used and apparently still use to give weight to the creation of the universe without a creator has been rethought. Scientist thought they were discovering everything that that made up the universe and created laws to generally explain how things work together. Recently the carpet was pulled and the curtains were drawn back to discover science was really only messing around with the laws and properties of a fraction (1/20th) of what is now known to be out there. Unfortunately, the other 95% is almost completely unknown except some reduction tests have concluded it is not at all like the other matter and energy of our applied science. The other 95-96% is not of the same stuff at all nor does it have the same rules as the 5% that is being propped as clues about the origin of the universe. My argument is you can't use science as a crutch to make bold claims that a self-aware creation entity did not or cannot exist because nothing scientific supports that. If it turns out dark energy has variable properties those variables might point to some kind of interacting intelligence and if that is established then the question is answered. So you're basically just clarifying that you truly don't understand the argument. That's cool too. You do know your evidence doesn't exactly have to be scientific right? If you're able to prove that this supernatural magic is true with other supernatural magic that we can observe, that'd be fine too. Do you see how what you're claiming is every bit as plausible (using your train of thought) as any other character from folklore? Well faith is a choice even in light of evidence. I am not here to tell you there is a god I am here to say folks should not be in faith decline businness to disprove a god without scientific support to back such a conviction. It is a faith system. Why don't you believe in Allah? Disclaimer: I DON"T THINK THE UNIVERSE IS INFINITE. Now we have people arguing whether or not the statement that the universe is infintite has truth value. THIS WAS NEVER THE POINT. Again, Kelly's retortion was a philisophical response, not a scientific one. She wasn't suggesting that 'the universe is inifinite' is true. The bible doesn't say anything about why God created the universe. It certainly doesn't imply that it was built only for mankind. If some Christians believe God created the universe for mankind only, they didn't get that idea from the bible. Humans live on earth. They can't live anywhere else. It is pretty irrational to think God created the universe for mankind. I don't even think He created the earth for mankind originally. I think using logical deduction proves that it has to be. If not the universe, then the matter it was formed from. If you think backwardly far enough to come to one of two basic conclusions. A: Something has always existed. B: It is possible for matter to just come into existence from nothing. Conclusion "A" implies that a phenomenon once existed "infinte matter" which there is absolutely no scientific evidence of even being a possibility. Conclusion "B" implies that a phenomenon once existed "something formed from nothing" which there is absolutely no scientific evidence of even being a possibility. So the only two logical possibilities both defy science. If there is another possibility (aside from the biblical explanation) I'd love to hear it. lol I believe in a self-aware creator. Call that creator what you wish I say. Yes they are dangerous and quite uninhabitable to humans and land animals. If you disagree with that, go jump off a ship at sea without a life jacket and see if you are able to tread water long enough for the sharks to eat you. Sure, we can build a boat and survive out there a little longer. But for that matter we can build a ship and survive in space for a while too. That doesn't change the point that neither the ocean nor space can be a permanent human residence at this point. But that doesn't mean God didn't create them. Just because most of the universe (which is laughable to think we have even caught a glimpse of most of the universe) is uninhabitable to humans and oxygen breathing lifeforms doesn't mean it is uninhabitable to all life. Who's to say there isn't a different kind of life somewhere else in the universe? The bible doesn't say that. Maybe it was created for angels. I think using logical deduction proves that it has to be. If not the universe, then the matter it was formed from. If you think backwardly far enough to come to one of two basic conclusions. A: Something has always existed. B: It is possible for matter to just come into existence from nothing. Conclusion "A" implies that a phenomenon once existed "infinte matter" which there is absolutely no scientific evidence of even being a possibility. I will also add, the fate of the universe is determined by the large scale structure of spacetime. When we talk of cosmic time, the planets, stars, you, I and the fish, we are pretty certain all that will expand, cool, and dissipate. Many scientist think dark matter and dark energy will remain. I think using logical deduction proves that it has to be. If not the universe, then the matter it was formed from. If you think backwardly far enough to come to one of two basic conclusions. First, I said 'the universe' and you responded and said "or the matter it was formed from. You changed my argument. Not allowed. Sorry. Is the universe not comprised of matter? Using bleeding edge physics (that is, physics over which there is currently no consensus) to argue a point is like building a castle on shifting sands: your pile of bricks is going to tumble down. 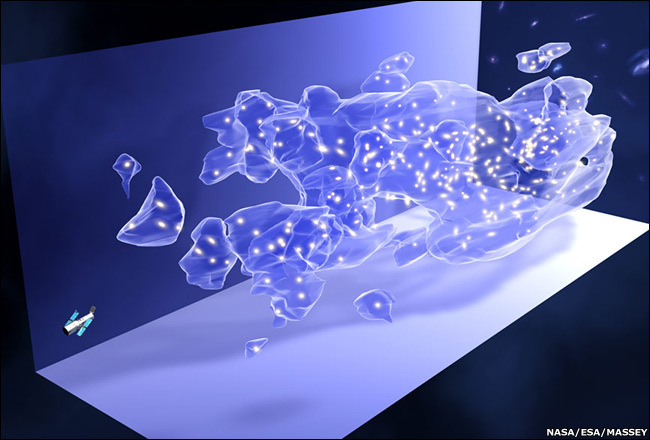 There is no consensus amongst scientists about whether dark matter or energy are true. If some debated hypotheses are true, then some measurements suggest that they do, and take up 95% of the universe. My personal view on this is that "dark stuff" is a "god of the gaps". People see their numbers are out, and say "oh... uh... maybe we can't see the rest?" It's a way for people to retain their ideas without alteration in the face of new ideas. Instead, I prefer alternative hypotheses, such as those that suggest gravity does not perfectly follow the inverse square law. It's not like there's a shortage of such ideas: there are so many, I've got really sick of reading about them. No consensus but more than a few good indications. I never thought there was a way that religous people could adopt the existance of extraterestial life into their personal god theory religion. But like all the rest of the discoveries science has made to contradict your ideas, religion always seems to revamp & change itself to keep rolling with each generation & the observable truths science discovers as time goes on. The reason the bible doesn't speak of extraterestial life is because the authors or ignorant humans that wrote it were not even aware to the fact that there even was a universe out past our atmosphere, they just thought everything moved against the background of the sky. But it is a good idea for you all to start forming your defenses for the existance of other life in the universe now, because in the near future you all are gonna need it. And It's OK if your not a good swimmer man, if it will make you happy we'll say that the oceans are dangerous too. But in a way that idea sides more with the point the Atheist are trying to make. I bet that if the every inch of the universe was inhabitable exept for a small sqaure foot just enough for us to breath, you'd still say god created it with all his "Perfect Magic". And Assuming that your personal god created sharks too, why would he even put them in the water anyway to gobble up his mirror image creation to begin with? And are there extraterestial looking angels floating around in space too? You asked a few questions and I'll try to answer them all. There is no mention of extraterestial life in the bible because it doesn't matter to us. Men did not write the bible, they merely dictated God's words. God certainly knew about any extraterestial life if there was any, because He created all things and that would include them. But again, what difference does it make to us? None. If there is any, we will never be able to reach them nor them us. The bible doesn't exclude this possiblity, nor does it support it. It is neutral. Why should'nt my spiritual perspecitve change as general human knowledge advances? The bible doesn't say anything about many things. It isn't meant to be a comprehensive guide to the universe and answer every question mankind could ever ask. It's an instruction manual how to live a life that is pleasing to God. And it's got a little history too. But that's it. Just because the bible doesn't answer the question about extraterestial life doesn't mean there is no answer. It doesn't mean that God was unaware of them. It just means that was a need-to-know basis, and we don't need to know. If we ever do come into contact with beings from another planet (which I seriously doubt we will) I'm sure the same rules apply to them. "Love your neighbor" would include neighboring planets I would think. I actually swim like a fish. We had a pool when I was young, and have always lived by a lake where I have water-skied, wake-boarded, tubed, etc. I love the water. But my point stands. It is very arrogant to assume that God created the entire universe just for us. It is also arrogant to assume we are the only race of people on the only inhabitable planet God ever created. In fact we know we aren't, because there are angels at least. Angels are a race that God created way before us. And I'm sure they aren't the only other ones either. Why are there sharks and other vicious animals in the ocean? There weren't originally. There were no carnivorous animals originally. That changed with the fall of mankind. The earth it'self became more hostile, and not just animals but even plant life. I imagine roses did not have thorns prior to the fall. The bible talks about how the earth will be once He comes back and restores it to it's original state prior to the fall, and it talks about animals being gentle and tame as one characteristic. This may sound absurd to you, but think for a second, if there really is a God, and He really is all the bible says He is, nothing is impossible for Him. The laws of science and nature do not apply to Him. He created those laws and He can bend or break, or even re-write them as He pleases. This made me think of where this concept of thinking come from. This made me thing about the Taliban Vs United States situation and the Rationality of Accepting Defeat, and it reminded me of the early Christians Vs Romans. I started thinking about the supposedly Roman crucifixion of jesus and that event basically forming Christrianity and what they believe. Then I came to the fact that Christrians and maybe every other religion thrives off of defeat. Faith is simply the Belief without evidence and also meaning that what ever happens in Real Reality doesn't make a difference to them because they don't egnolage Facts or a true sense of reality to begin with. If jesus was real he started his own little Cult that went Against The Law, and in return the Romans executed him to make a statement. By ingnoring the magic and just looking at what's going on it puzzles me how they could bounce back from that, but knowing religion they always seem to pull it off one way or another. They adjust to the changes and keep on rolling....Sort of like a Delusional Evolution, kinda Ironic isn't it. If a Religious Person wants to understand what Evolution is, tell them to just take a look at how their Bible(s) and it's Faith based beliefs have changed and revamped over time to keep up with the generations and there you have it. But anyways After his supposed death it took them a good generation or two but they came up with something out of thin air that could save their belief with. They can't except defeat because their so emersed into their Delusion that they fail to observe what's really going on. They think that there's a bigger picture that goes beyond rationality and the "Truth", which is more evident than anything. They've lost all the rational "battles", but they magically see beyond that believing that there's a "Bigger War" that the none believors just aren't seeing. But in actuality the "battles" make up the "War" and dictates it's outcome. The idea of small changes effecting or defining something on a larger scale just isn't something Theists are aware of, this can explain why they just don't understand Evolution. In the end, no one can use any scientific concept to defeat the concept of a creator. Not because of denial but because the science we need to explore most of what needs explored has not been thought of. The study of all we know can ONLY be applied to 4% of what we know and have tested to be out there. Science has only pointed to something bigger and stranger that is beyond our grasps and understanding for now. Have evolution as time can be manipulated, have all arguments of normal matter and advance on those theories but don't run to the "event horizon" or fellow human-being with that science in hand as if it will hold any true clue to what drives most of the universe or its creation. I welcome scientific discovery because I think evidence in a creation entity will be found in Dark Energy. I admit it is just a guess but my guess is as good or even better than the head-in-the-sand stand others are using by refusing to admit what we thought of physics and the universe has been turned on its head and all science used to try and defeat the "God Question" should be reconsidered and reduced to its proper place of understanding. Which is knowledge in that we have an understanding of mostly nothing with concern to what is out there, how 'out there' behaves or how it was possibly formed. Faith is indeed a belief concept. In the end, no one can use any scientific concept to defeat the concept of a creator. Not because of denial but because the science we need to explore most of what needs explored has not been thought of. I'd disagree, and say that it's because it's impossible to prove that something with no testable attributes never existed. The science will never be thought of, because it's physically impossible to do so. If someone claimed "well, if we look really hard in the cosmic background radiation, the fluctuations within it will be the utterances of God", then we could test it and demonstrate that those fluctuations arose from some other cause... but that doesn't disprove a Creator, it just disproves that the echo of his voice is in the CBR. At it's simplest, there is no test that can be done to disprove an omphalitic creator: you cannot prove that the whole of creation was not created, belly buttons and worn teeth and memories and all, last lunchtime. Or a few thousand years ago. Or at the big bang. The study of all we know can ONLY be applied to 4% of what we know and have tested to be out there. Definitely disagree there. I'm guessing that you're getting the 4% number from the hypothesis that there's dark matter and/or energy out there, which is an argument that astronomers and physicists themselves argue rather stringly(*) over. Even if dark matter and energy exist, their posited behaviour is to act in ways that exactly match "bright" matter: except they just don't glow. If they didn't act like all other matter, there'd be no way to say they whether they make up 94% or 1% of all matter. That is, the dark matter hypothesis says "uh... we don't have enough matter to make these numbers work. Let's add 25 times more normal matter in to make them work. It can't be completely normal matter, 'cos we'd see it, so we must hypothesise that it's invisible. We'll call it the 'Invisible Pink Matter of the Gaps'... no, that exposes our ignorance, let's call it 'Dark Matter', and then it sounds rational". don't run to the "event horizon" or fellow human-being with that science in hand as if it will hold any true clue to what drives most of the universe or its creation. Why not? Why not say "we see these footprints, we think something must have walked here"? 1) Throw up your hands. Shrug. "Goddidit". We don't need to look at anything. 2) Disbelieve that god did it, and accept that there are footprints in the butter that point to something happening earlier on. It's an interesting intellectual exercise to examine those footprints and try to establish from them the shape of the elephant. 3) Believe that Goddidit, but accept that the footprints still exist. So, He made those footprints too. In that case, it is critically important to study those footprints, because (other than, possibly, a holy text) they are the only physically examinable message that he has left us. Why did he make the universe appear to be this age? Why did he make all dating systems consistently point to this story of universe creation? Was it because that's how he made the universe and the young-earthers are wrong to interpret it that way? Or because he wanted to send a mesage? Whether the former or the latter, it is critical to follow the trail of evidence to the end, because (other than, possibly, a holy text) it is the only physically examinable message that he has left us. 4) Something I have not thought of (included to prevent "false dilemma"). I go for option 2, but I know theistic scientists who go for option 3, and they are really keen to find out what God wanted them to find out. People question stuff like dating methods, but do they really think that scientists who're examining these things because they believe it's what God requires of us, would not double and triple check everything that conflicts with the bible? I welcome scientific discovery because I think evidence in a creation entity will be found in Dark Energy. Evidence of a creation entity will be found in something we can't see, hear, smell, taste, touch, or even measure, except in terms of our own ignorance... yeah, maybe. Personally, I see it as evidence of invisible unicorns. All that invisible energy? It's really just invisible unicorns in harnesses, pulling things about to mess with our minds. Sorry, you lost me. Which turning-on-the-head are you referring to? It happens so often in science that one loses track. It's why science advances. Generally, people don't deny the head-turning for more than a generation or so, so I guess it must be some current one? all science used to try and defeat the "God Question" should be reconsidered and reduced to its proper place of understanding. The place that "there is no way to prove a negative"? I think we've known that one for millennia, so no real reduction or change there. we have an understanding of mostly nothing with concern to what is out there, how "out there" behaves or how it was possibly formed. Hope that in my ramblings I've managed to show that that's not proven. That we have some equations where the numbers don't fit, doesn't mean we know nothing about 96% of the universe. Though to some theorists, it suggests that 96% of it is magically invisible not very bright. I'd disagree, and say that it's because it's impossible to prove that something with no testable attributes never existed. e303 - Wrong. The attributes needed for scientific discovery and verification are in place. We are already testing the waters of the unknown in these areas using science. Simply believing there is nothing to be discovered that can lead to an intelligent entity does not make it so. The science will never be thought of, because it's physically impossible to do so. e303 - I don't see how you can sustain that. Again this is just a belief which is cool as it favors your position but has no impact on the greater questions. e303 - I agree with this, though I would not claim cosmic background IS the utterances of God. I would say however we have at least places to look vs ...all there is to know is known and therefore a God does not exist as some seem to claim here. e303 - That might NOT be true. We can test for indications of intelligence and it may turn out science is at a loss as to why something or something behave or exist contrary to all other scientific explanations. This does not mean there is a God for those who want their own burning bush I guess. e303 - The study of all we know can ONLY be applied to 4% of what we know and have tested to be out there. I guess you like the ideas of string theory. You should then know no version of string theory has yet made an experimentally verified prediction that differs from those made by other theories. The question is whose magic yours or mine? Even if dark matter and energy exist, their posited behaviour is to act in ways that exactly match "bright" matter: except they just don't glow. e303 - Wrong. I know the words "matter" and "energy" are confusing but they are not like as you call "bright matter" at all. Those words have been added as place holder words until science gan grab onto what they really are. We know they do not act like "bright matter" at all. If they didn't act like all other matter, there'd be no way to say they whether they make up 94% or 1% of all matter. e303 - Mathematics offered a predictor and it seems to hold up. e303 - Have a look at this link for better understanding. 4) Something I have not thought of (included to prevent "false dilemma&quot . e303 - Why draw a conclusion and mark it inevitable without knowledge? I think we discover things for knowledge not for proof of God but this does not mean they will not accidently find evidence. Indeed I think scientific understanding and God have never been more close. e303 - I welcome scientific discovery because I think evidence in a creation entity will be found in Dark Energy. e303 - "...refusing to admit what we thought of physics and the universe has been turned on its head." e303 - Stay with me... You are calling these things truly invisible but we have some ways of testing some of the properties or the "unknown matter and energy" and thus existence using Hubble flow variations. It does not prove a God but it does open the door to new discoveries and slams it shut on the argument that science has evidence that points to gods non existence as some on this site have asserted. Science proves nothing yet. e303 - "...all science used to try and defeat the "God Question" should be reconsidered and reduced to its proper place of understanding." The point I was making: Conclusions based on "scientific evidence" pointing to the non-existence of god is simply wrong. There cannot be any true scientific conclusion if one wants to keep in the realm of science. I think it is fine for a person to have a belief about the non-existence of a creator and base it off their own knowledge and understanding but it is no more valid than those who say look harder and you will find the answers. e303 - "...we have an understanding of mostly nothing with concern to what is out there, how "out there" behaves or how it was possibly formed." e303 - I did say mostly nothing and my statement stands. e303 I was just wondering if you were religious? Because if you are you've gotta understand that all your Hypotheses don't help in the favor of there being an existance of a personal "god", but rather a creator. But I've been thinking that this creator can just simply be Natural Process of Nature, which can seem magical sometimes. Kinda how religious people ironically say that god is all around you & them while at the same time pointing to the matter around them. But in a lesser way their correct because they could just unknowingly be worshiping all the matter that was crammed into the Big Bang Singularity. But even the Big Bang can be classified as a Quantum Fluxuation, or even a Black Hole on a enormous scale. What ever science discovers people will always associate it with god. If you ask an astromist what seems to be the purpose of the universe and they'll tell you that it's purpose is simply to create Black & even White Holes. I think that the presence of Dark Matter should point to reasons why existance didn't need a creator. This reminds me of Electricity, something I'm completly obsessed of. It can seem magical to all that want to classify it in that view, but everything in Existance will Always have an explination and there for always being in the grasps of Science. I think if you are open to the possibility of a creator it opens the door to a whole set of possibilities including a more personal and interactive God for some. Have I seen a living god? No. Do I need my own burning bush to think a personal god exist? No. Electricity is very interesting indeed BTW. Read anything on Telsa? e303 - Wrong. The attributes needed for scientific discovery and verification are in place. Excellent - you have found yourself a falsifiable Creator? Awesome. In that case, yes, I was clearly wrong about it being impossible to disprove it. So... what are the testable attributes of this Creator? All we need is one single falsifiable attribute, and we'll finally have nailed this problem that has baffled so many billions of people for so many thousands of years! Though, you seem to be suggesting that there aren't any, but you might stumble across some sign of it. I say: i that case, believe in it then. Until then, there is no evidence at all that the universe was made intelligently. Excellent - you have found yourself a falsifiable Creator? Awesome. In that case, yes, I was clearly wrong about it being impossible to disprove it. So... what are the testable attributes of this Creator? All we need is one single falsifiable attribute, and we'll finally have nailed this problem that has baffled so many billions of people for so many thousands of years! Though, you seem to be suggesting that there aren't any, but you might stumble across some sign of it. I say: i that case, believe in it then. Until then, there is no evidence at all that the universe was made intelligently. 7. New designs in nature Complex new designs would be rare and develop slowly whereas simple transitions would be common No restriction on designs with the possibility that new designs would be created "overnight"
Sorry, can't speak for the "Anti-Supernatural" strawman since I know nobody who holds these beliefs. You can't put words in to my mouth, or the mouths of others, and expect us to defend them, especially where they are indefensible. You are also putting words into the mouths of theists: I am pretty sure that very few young-earthers believe that life emerged "early" or that it emerged under "adverse conditions." You can't get much less adverse than being made by God to fit your niche perfectly in the garden of Eden. So you should probably change your headings to "What I think atheists believe" and "what I believe". Let's hit those in turn. Single transcendent beginning:	will be refuted. No: cannot be refuted. The word "transcendent" is a woolly term anyway, needing definition. What does it transcend, and in what ways? If that claim means "There was a beginning before which there was nothing" then it cannot be refuted, nor proven true. The best we can hope for is to show whether or not there is any information that passed into the universe through the big bang. So far, signs and theory both say no, so we can't establish anything either way about any prior universes or their existence. If we could conclusively demonstrate that there was a subtle indication left in the universe that told us that there was a prior universe, that still would not disprove the idea that at some point, that universe too came from nothing. If our universe came from the collision of two branes, we cannot disprove the idea that those branes came from nothing. However far back we go, there will always be an "earliest thing" that we can find evidence for, and we cannot prove that thing came from something else, without having evidence of that even earlier thing... and then we have to prove for THAT and so on. So, we can never prove it. No: there is no indication of design, artefact or otherwise. No: no guarantee of that whatsoever. They may exist, they may be found, but there is no guarantee of either. No. There is absolutely no evidence to support that claim. It may turn out to be true, but there may be no other life in this galaxy at all. In others... who can tell? Not us. For life, we have a sample size of one, we can't reasonably extrapolate from that. Once we have instruments powerful enough to establish the chemical makeup of the atmospheres of distant earthtype planets, then we'll be able to get a reasonable sample size, and be able to guess at the rarity of life. Until then, any claim to know is just conjecture. At the moment, we're still working on detecting the earthtype planets themselves (we've only just found one), and detecting atmospheres (we've found two, I think). No: plenty of naturalistic scenarios have already been proposed. It is likely that we will never find out how life formed, but we may certainly form life of our own in petri dishes someday. No: "almost no oxygen" seems somewhat less than ideal to me. And the earth is still hardly "ideal" for life, even now. But it is "good enough" now, and was then. No: entire new species can form through hybridisation, and this has been seen in nature. But, yes, stuff that the ID would claim are "irreducibly complex" cannot generally be created in one step and need to be reduced. So far, all have shown to be reducible. There is a vanishingly small probability that a significant feature like an eye could form without natural selection, purely through mutation: not possible enough to be worth considering. No: after a mass extinction, there are a huge range of niches opened up to those creatures that were previously underdogs. The recovery should be far faster than the evolution between: see Gould's work on punctuated equilibrium. In summary: the views of the "Anti-Supernatural" strawman are unlikely ever to be upheld. How? What possible evidence could support that? Other than finding that on the far side of the moon there's a signature "God"? 2) stable self-organisation maintained by the system: evolution, the earth's atmosphere. 3) Stuff that just had to be that way because of its mathematical properties: fractals, pi. 4) the anthropic principle: the fine-tuning is something without which we would not be here, so we cannot, with a sample size of one, say whether it is likely or not. So, I have a hard time seeing how this would be falsifiable. That's a falsifiable prediction, but not one that all theists agree on. If they were found abundant, it would not affect the beliefs of most theists in any way: if non were found, it would not affect atheists. Non-falsifiable/irrelevant. Maybe if you hadn't said "rare or", then you would have been making a falsifiable statement, but even then, it's not a claim that atheists would disagree with. Already falsified, since there are plenty of theories about abiogenesis, which do not require ID by God. Already falsified by the fossil record. New designs in nature - No restriction on designs with the possibility that new designs would be created "overnight"
Hrm - yes. Got me there! If you could show a new sensing organ appearing overnight in a population, under laboratory conditions, then that would be pretty good atheism-falsifying evidence. OK, given the current mass-extinction caused by man, if you could repopulate the world with new species overnight, I'd take that as a pretty good falsification of atheism too. Some good points. I am going out of town with friends but would love to hammer on these things after the holiday. e303 - Fair points. OK - "What I Think many Atheist Believe" and "What I think many Theist Believe." Single transcendent beginning: will be refuted. No: cannot be refuted. The word "transcendent" is a woolly term anyway, needing definition. What does it transcend, and in what ways? If that claim means "There was a beginning before which there was nothing" then it cannot be refuted, nor proven true. The best we can hope for is to show whether or not there is any information that passed into the universe through the big bang. e303 - I guess it is fair to ask for a clear definition of a transcendent being. Let's say self-aware entity that can act and interact with the physical and metaphysical universe. A manipulator of normal time and matter in ways we cannot understand or verify at this time. So far, signs and theory both say no, so we can't establish anything either way about any prior universes or their existence. e303 - You are right we can't establish anything either way at this time which is exactly why I joined this forum. There are those on this forum who think science supports one position over the other. If logic is truly their captain they must admit they also don't have enough information to make a strong statement of conclusion nor argue from a position of knowledge when the knowledge needed is incomplete. I think there was an intelligent banger of the big bang and others don't. This is very fine. We have opposing belief systems and nothing more because our positions at this time cannot be verified. Does the solution solve the problem? The first of three principles of verification involves the subjective test. Does the solution eliminate the quandary? Is the problem, in the light of the solution, no longer a problem? Verification II: Are the elements of the solution self-consistent? Once the presuppositions that make up the statement of the solution (the theory) are articulated are they mutually coherent? A solution, which contains a contradiction, cannot endure as a solution through time. Eventually, the logical error will result in practical failure, and thus in the re-emergence of the initial problem or some new problem. Verification III: Are the elements of the solution logically consistent with existing paradigms? Since the solution to any problem must coexist with the myriad solutions to other problems, which we regularly confront, the same principle that applies internally, applies also externally. Where we employ two mutually exclusive theories to deal with different problems, one or both will eventually prove to be untenable, and their status as solutions will be invalidated in failure. Since most of what needs to be tested is mostly out of our reach we cannot make any assumptions using the scientific methods to validate the origin of the universe let alone a creator. This is the universal epistemology and it applies to the practical, the scientific and the spiritual. Where all differ is where we think the conclusion will end. e303 - 100% with this argument. We all must admit we simply don't know and have no way to knowing at this time using scientific methods. Pretty much my whole soapbox from day one on this site. This argument does not discount the possibility of new information arriving in support of or against a creator our ultimate creation. e303 - It is simply wrong to think there will ALWAYS be an "earliest thing" that we can find evidence for. That statement is a guess that can't be supported. How can anyone know or predict proof will never come? On the subject of design. - The properties and Laws of Baryonic Matter may all be part of a design infrastructure. According to most leading astrophysicist, dark matter may be invisible but it accounts much of the Universe's mass. Its gravitational attraction acts as a template, pulling normal matter - the stars in their galaxy groupings – into the large-scale structures we can see through telescopes. I think this template might be one of design because it seems to not be uniform in distribution. but keeps our observable galaxies from flying apart. This utterly inexplicable force is one of nature's great unsolved mysteries. While I know there are those who will say that does not mean, "God did it." All I can say to these folks who need their own burning bush is that it doesn't mean "God didn't do it." and for now, we should be open to the possibility and actively looking for evidence of a planned design patterns that defy what seems contrary to our expectation. e303 - I agree but I think, in general, most who think there is no god also think there are certainly other planets like ours with life. I can't not confirm or deny either position and think it is possible. Existence of life in the universe life will be found to be abundant in our galaxy, since it is simply the properties of chemistry and physics. e303 - Again, I agree!! I think, in general, most who think there is no god think life is simply properties of chemistry and physics and that given the amount of stars and planets out there life probably does exist and will be found. e303 - Right and those earthtype planets seem to be nothing like earth. Prebiotic chemistry a naturalistic scenario for the origin of all biochemical pathways and replicative molecules will be found. e303 - This comment is a bit confusing as it seems to confirm what I am saying about many who argue against a creator in that they tend to share the view that naturalistic scenario and I dare say overnight evolution and creation. e303 - agree. This does not mean the primordial soup is good fact or fiction. I allow evolutionary concepts to have its place given our current knowledge of space-time and relativity. It could be things did hyper-incubate from one perspective and it took millions of years to progress from another and those things are consistent with our molecular construct. Without God, logical conclusion that likes (living things) are likely to live in the environments of other living things seems probable to me. e303 - I don't know why one would think complex systems would not have similar structures. Who has ever said the contrary? e303 - I agree with you on this and knew about punctuated equilibrium. e303 - Fair enough. I will add however, I don't think this was such a strawman given many of these general reasons for de-constructing a pro god belief and (anti-supernatual) argument have been brought to conversations by many atheist many times before in one form or another. That said, let's do move to falsifiable as it is often a clever but completely invalid response in defense of claiming there is or is not a God unless you add the words..."I think..." or "I believe...." based on its own definition as it applies in science. Falsifiability: an important notion in science and the philosophy of science. For an assertion to be falsifiable it must be logically possible to make an observation or do a physical experiment that would show the assertion to be false. It is important to note that "falsifiable" does not mean false. e303 - It may very well be evidence to support a creator emerges in the form of reductions and inexplicable results without knowing the future one cannot say for sure but one can say they think evidence will increase. The verification methods already established should be the filter. This does not mean is not-falsifiable only the set of variables needed are not yet known at this time. It is just very difficult and more information is needed. Fine tuning: more examples of extreme fine tuning will be found, indicating true design. e303 - Irrelevent maybe but falsifiable? How so? e303 - Yes I agree. e303 - The point was life as a concept is complex even that of the single celled organisms and you just said in this reply post "almost no oxygen" seems somewhat less than ideal to me. And the earth is still hardly "ideal" for life, even now" which indicates perhaps adverse conditions still exist. Claiming that there "can't" be a god is just as inane as claiming that there is any evidence whatsoever for its existance. I have not encountered anyone that claims that it is impossible for a superwizard to exist, just that there is no reasonable evidence of any kind to believe so. The way I generally see it being used is "strong atheism" vs "weak atheism". For some time I defined myself as weakly atheistic against the idea of gods in general (agnostic: their existence cannot be disproved, but is unlikely), but strongly atheistic against a god with any claimed infinite properties. I now consider myself strongly agnostic, and claim that there is an infinitely small probability of there being any form of intelligent overseer of the universe, for the creation of life, or for the creation of the universe. And "infinitely unlikely" is near as damnitt the same as "does not exist", so, strong atheism. Modern observational science has shown that the universe is not eternal and thus a non-eternal universe implies that it must have been caused. I think this is enough rational eveidence to have faith and belief for many. Without question it will not be nearly enough for some but what does that matter?